350 pages | 83 B/W Illus. This book has been prepared to help psychiatrists expand their knowledge of statistical methods and fills the gaps in their applications as well as introduces data analysis software. The book emphasizes the classification of fundamental statistical methods in psychiatry research that are precise and simple. Professionals in the field of mental health and allied subjects without any mathematical background can easily understand all the relevant statistical methods and carry out the analysis and interpret the results in their respective fields without consulting a statistician. The sequence of the chapters, the sections within the chapters, the subsections within the sections, and the points within the subsections have all been arranged to help professionals in classification refine their knowledge in statistical methods and fill the gaps, if any. Emphasizing simplicity, the fundamental statistical methods are demonstrated by means of arithmetical examples that may be reworked with pencil and paper in a matter of minutes. The results of the rework have to be checked by using SPSS, and in this way professionals are introduced to this psychiatrist-friendly data analysis software. The language of the book is very simple and covers all aspects of statistical methods starting from organization and collection of data to descriptive statistics, statistical inference, multivariate analysis, and meta-analysis. Two chapters on computer applications deal with the most popular data analysis software: SPSS. The book will be very valuable to professionals and post-graduate students in psychiatry and allied fields, such as psychiatric social work, clinical psychology, psychiatric nursing, and mental health education and administration. "Practicing physicians and psychiatrists, even those with academic pretensions, are often overwhelmed by study designs and statistical analysis. . . . The author [of this book] has recognized statistical needs of physicians and has attempted to present a simplified approach to statistics. 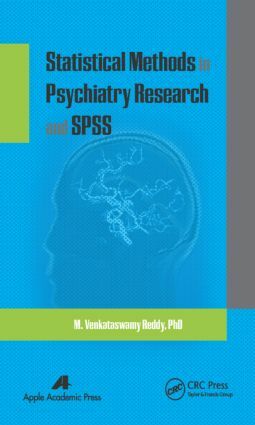 The book provides an overview of psychiatric research, classifies statistical methods, describes types of data and variables, introduces quantitative and qualitative variables, elaborates study designs, discusses descriptive statistics, illuminates the basis of statistical inference, explains statistical tests of significance, and introduces correlational, multivariate, and meta-analysis. Each chapter focuses on a single aspect, introduces the issues, describes statistical theory, and provides examples. It also provides details of how to use the Statistical Package for Social Sciences (IBM SPSS Statistics) computer program for such analysis. The book is an attempt to fill the long felt need for a simple statistical text, useful for physicians and psychiatrists. . . . It will certainly help those who have a basic familiarity with statistical methods and analysis . . . . The book steps in the right direction for those who want to independently analyze and interpret data." M. Venkataswamy Reddy is a permanent faculty member at National Institute of Mental Health and Neuro Sciences (NIMHANS), Bangalore, India, and has over 30 years of teaching experience. He has published more than 20 scientific papers. His popular textbook, titled Statistics for Mental Health Care Research, is widely referred to by students and academicians alike. His main contributions include the development of suitable models for mental health delivery systems in India, meta-analysis for psychiatry research and STATA, and cluster analysis for psychiatry research and SPSS. He received an MSc in statistics from the Department of Statistics at Bangalore University; a DBS (PG diploma in biostatistics) from ICMR’s Institute for Research in Medical Statistics, New Delhi; and a PhD in biostatistics (topic: cluster formation in psychiatry with special reference to child psychiatry) from Bangalore University.